Happiness as Measured by GDP: Really? - How Do You Think? Happiness as Measured by GDP: Really? Citizens of the United States are endowed with certain unalienable rights: one of which is the right to pursue happiness. Governments generally need to attend to the common level of happiness of its citizens in order to sustain power. As evidenced by the Arab Spring, unhappy people have the capability to overthrow ineffectual governments. As it turns out, the way politicians and economists presume to measure happiness is through a statistical measure called the Gross Domestic Product (GDP). Let’s take a closer look at GDP and ponder the questions as to whether it is, in fact, an appropriate measure with regard to overall happiness. The total market value of all final goods and services produced in a country in a given year, equal to total consumer investment and government spending, plus the value of exports, minus the value of imports. GDP is the measure we look at to determine whether our economy is growing, in recession, or in depression. This makes sense. But the deeper fundamental belief is that GDP equates to personal wealth, and that the more personal wealth individuals posses, the happier they will be. Our economy grows when people have money and spend it. The bottom line assumption here is that money buys happiness. Since developed nations have strategically attended to this measure, GDP has skyrocketed. Concurrently, there have been unequivocal rises in living standards and wealth. The United States has done relatively well in this regard. But you might be surprised to know that according to a CIA website, the US ranks 12th in the world on a measure of GDP per capita adjusted for purchasing power parity (PPP) behind countries like Qatar, Luxembourg, Norway, Singapore, Hong Kong, and Brunei. In poor nations where GDP is very low, quality of life and subjective measures of happiness are indeed low. As GDP increases, there is a correlated increase in both quality of life and happiness. But that relationship holds up, only to a certain point, and then it falls apart. For example, in developed Western Democracies such as the United States, UK, and Germany, since the 1970’s, GDP has grown, but on a variety of measures, the happiness of its citizens has stagnated or declined. See the chart below from James Gustave Speth’s book The Bridge at the Edge of the World. As it turns out, when a nation’s GDP rises above $10,000.00 per capita there is no relationship between GDP and happiness. For a reference point, in the United States our GDP per capita rose above this $10k point in the 1960s and is currently around $50k per capita. The reality is that despite a five-fold increase in personal wealth, people as a whole, are no more happy today than they were in the 1970s. This suggests a fundamental flaw in the thinking of our policy makers. 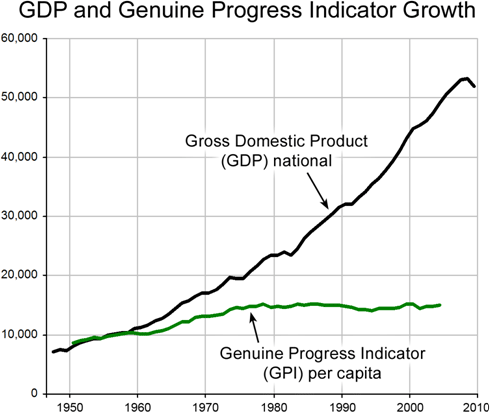 I am not alone, nor am I first to point out the problem with assuming that GDP equates to citizen happiness. James Gustave Speth, provides a ground shaking critique of our current political, economic, and environmental policies in his 2008 book The Bridge at the Edge of the World. This GDP-Happiness issue is a prominent theme in his book and he explores what actually accounts for happiness. What follows is a summary of Speth’s discussion of this topic. Research suggests that there are a number of important factors associated with individual happiness. What is interesting is that the major factors are relativistic, innately internal, as well as social and interpersonal. Yes, below a certain point, when people are impoverished and struggling to survive, happiness is indeed tied to GDP. But above that $10K GDP per capita line, these other human factors play a major role. Let us start with perhaps the most powerful factor associated with happiness, our genes. It is estimated that about one-half of the variability in happiness is accounted for by our genetic composition. One’s happiness is much like one’s personality, to a large extent it is written in our DNA. Some people are just congenitally happier than others. Some are chronic malcontents no matter what the circumstances provide. Such proclivities are difficult to over ride. But the remaining 50% of variance in happiness does seem to be rooted in variables that we can influence. One’s relative prosperity is a clear variable. There is an inverse relationship between happiness and one’s neighbors’ wealth. If you are relatively well-off compared to those around you, you are likely to experience more happiness. If however, you are surrounded by people doing much better than you, you are likely to experience discontent. It is more about relative position rather than absolute income. And as everyone’s income rises, one’s relative position generally remains stable. So more money does not necessarily equate to more happiness. Yet another innately human factor that plays out in this happiness paradox is our incredible tendency to quickly habituate to our income and the associated material possessions that it affords. We seem to have a happiness set point. There may be an initial bump in happiness associated with a raise, a bigger better car, or a new house; however, we tend to return to that set point of happiness pretty quickly. We habituate to the higher living standards and quickly take for granted what we have. We then get a relative look at what’s bigger and better and begin longing for those things. This is the hedonic treadmill. Speth notes that “except for health and income, they are all concerned with the quality of our relationships.” We clearly know that people need deeply connected and meaningful social relationships. Yet we are living increasingly disconnected and transient lifestyles where we relentlessly pursue increasing affluence all the while putting distance between us and what we truly need to be happy. We are on that hedonic treadmill convinced that happiness comes from material possessions, all the while neglecting the social bonds that truly fulfill us. Although GDP is an important economic measure, many economists and some leaders suggest that we should assess well-being more precisely. For example, alternatives include the Genuine Progress Index (GPI) that factors into the equation environmental and social costs associated with economic progress. See the graph below for how we in the US have fared on GPI. This GPI data suggests that since the early seventies there has been a clear divergence between GDP and the well-being of the citizens of the United States. This GPI line correlates strongly with the relative happiness line over the same time period. Another effort made with regard to measuring the well-being of the citizens is the Index of Social Health put forward by Marc and Marque-Luisa Miringoff. They combined 16 measures of social well-being (e.g., infant mortality, poverty, child abuse, high school graduation rates, teenage suicide, drug use, alcoholism, unemployment, average weekly wages, etc.) and found that between 1970 and 2005 there has also been a deteriorating social condition in the United States despite exponential growth in GDP. The New Economics Foundation in Britain has developed the Happy Planet Index (HPI) that essentially measures how well a nation converts finite natural resources into the well-being of its people. The longer and happier people live with sustainable practices the higher the HPI. The United States scores near the bottom of this list. At the top of the list in the Western Developed nations are countries like Malta, Austria, Switzerland, Italy, Iceland, and the Netherlands (due to long happy lives and lower environmental impact). At the bottom across all nations are countries like the US, Qatar, UAE, Kuwait (each as a result of atrocious environmental impact) and Rwanda, Angola, Sudan and Niger (due to significantly shortened life spans). All this taken together seems to suggest that we would be better off as a citizenry if we radically re-prioritized our economic, social, and environmental policies with increased focus on factors that more closely align with human well-being. Yet, we continually forge ahead striving unquestionably for economic growth because we believe it will make us better off. Closer scrutiny suggests that we should broaden our thinking in this regard. If we were to focus our energies on GPI and/or HPI, like we have on GDP over the last 50 years, just imagine what we could accomplish. Central Intelligence Agency. The World Fact Book: GDP per capita adjusted for purchasing power parity (PPP). Guild, G. (2011). We’re Number 37! USA! USA! USA! Johnson, J. (2010). International Education Rankings Suggest Reform Can Lift U.S. US Department of Education. Speth, James Gustave. (2008). The Bridge at the Edge of the World. New Haven: Yale University Press. 2012 – A Year in Review: How Do You Think? - How Do You Think? I would like to include the two graphs (Average income versus happiness; and GDP versus GPI) from this article in a sustainability book I am writing and self publishing. Each graph will be approximately 2-3/4″ wide, and the proper source cited with the image. I would greatly appreciate permission to use these two images. If you are not the copyright holder, can you please help me contact the correct person? Thank you so much! in Speth’s book, but it’s not exactly the same as the one I have in my article. I’ve searched for my source because I want the article to be properly referenced but I’m coming up empty. My apologies to you and all my readers! I will strive to track that image down or change it and reference it properly. Good luck to you on your book – I’d very much like to read it when you publish. « So your partner drives you crazy? You’re not alone. Here’s why.